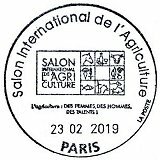 Since 2013, La Poste has been issuing sets of 'traditional' stamps dedicated to France's natural heritage as exemplified through its breeds of farm and domestic animals, and every year participates at the Salon International de l'Agriculture, in Paris with its own stand. Without doubt, it is an excellent way to publicize and market the stamps to the general public. In the same vein, La Poste also participates in the Salon des seniors. The Salon International de l'Agriculture is the largest annual agricultural show in France. The 2019 event was held from February 23rd to March 3rd, occupying all the pavilions of the immense Parc d'Expositions Porte de Versailles. In this its 56th year, the theme was 'Women, men and their expertise'. An animal is chosen, each year, as the mascot or public image of the fair; the 2019 show mascot was a 5-year-old 'Bleue du Nord' cow called 'Imminence'. Some statistics to characterise the size of the event. More than 1,000 exhibitors from 22 countries, 1,400 farmers and nearly 3,000 animals participated in the 2019 show. During the nine days, over 633,000 visitors were able to participate in the entertainment available, workshops and competitions, discover the products of the regions of France and, in general, learn about everything to do with agriculture and the cattle industry. 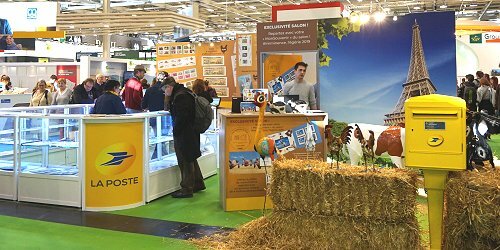 Although it was the seventh occasion Phil@poste had participated in this agricultural show in Paris, it was however, the first time in this 2019 event, that the 'agricultural' philatelic offer was complemented with the release of a special LISA vignette. The design of the new LISA and the associated postcard (image below) is by Geneviève Marot. Both images show rural agricultural scenes, with several farm animals. In addition to the LISA issue, Phil@poste sold a special collector's folder or 'MonSouvenir' illustrated with the 'Imminence' cow. The range of philatelic products on its stand was completed with many stamp booklets and collections released in recent years, depicting all kind of animals. 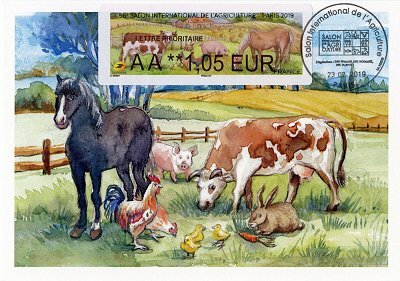 Along with the new issues, Phil@poste produced a commemorative postmark with a daily change of date, illustrated with the logo and the theme of the show, 'L'agriculture: Des femmes, des hommes, des talents!'. This time however, Phil@poste did not install a kiosk on its stand (right image). Instead packs of four stamps were sold with the basic values ​​of domestic and international mail (CC - Ecopli, DD - Lettre Verte, AA - Lettre Prioritaire and IP - Lettre Prioritaire Internationale), with the new postage rates in force from January 1st 2019. These stamps had been printed before the show by the back-office computer system and a Brother printer. Unlike the stamps issued with this same system for the last Salon Philatélique d'Automne (see article, also published in VARIABLE 51), these stamps have two asterisks in front of the face value. In total 3,000 packs of four stamps were produced.